bounded posteriorly by the central sulcus and anteriorly by the precentral sulcus. a convolution of the cerebral hemisphere immediately anterior to the central sulcus of the cerebrum in each hemisphere. It is the location of the motor strip that controls voluntary movements of the contralateral side of the body. 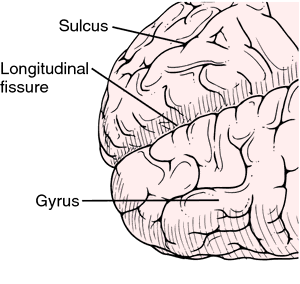 Also called anterior central gyrus. Therefore, hands and face (which has the highest density of sensory receptors, respectively, motor innervations) are controlled by the largest area of precentral gyrus (motor) and postcentral gyrus (sensory). 5T) fluency bilateral frontal gyrus, inferior frontal gyrus, anterior cingulate, and right precentral gyrus among patients with first-episode schizophrenia. Results showed that difference in mean oxy-Hb values in the right area of the inferior frontal region and precentral gyrus significantly discriminated Japanese from non-Japanese groups (right 3ch: Wilks' X= 0. For instance, repertitive transcranial magnetic stimulation (rTMS) could be provided over the precentral gyrus of the left hemisphere during wakefulness while the subject performs a task involving dexterity of the right hand. Sleep and memory: can learning be enhanced? Combining structural MRI and fMRI, Ye and colleagues  were the first to document decreased density of the right dorsolateral prefrontal grey matter among patients with depression; they also observed decreased FC between the right dorsolateral prefrontal cortex and right parietal lobe and increased FC between the right dorsolateral prefrontal cortex and the left dorsal cingulate cortex, left parahippocampal gyrus, thalamus and precentral gyrus. Some areas of the brain were activated during both lying and truth-telling, but there were five activated areas unique to lying: two in the frontal lobe (the right precentral gyrus and the left medial frontal gyrus), two in the temporal lobe (the right hippocampus and the right middle temporal lobe), and the anterior cingulate of the limbic lobe. sup] reported that gray matter volume was reduced in the left precentral gyrus and right fusiform gyrus in patients with depressive cognitive tendencies compared to that in healthy controls.